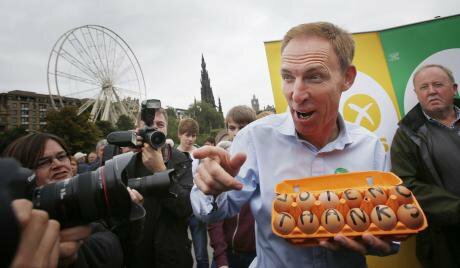 Is Labour ‘ready to govern’ – or are there more eggs to break? From Brexit to the current battle for the Scottish leadership, Labour can’t duck the hard questions. A new book from a key Scottish Corbyn ally recalls the battles of the past, but leaves the future uncertain. Image: Jim Murphy of Scottish Labour during Scottish referendum campaign. PA Images, all rights reserved. Today, Jeremy Corbyn will tell the Labour Party Conference gathered in Brighton that Labour is “ready to govern”. Spirits are high – perhaps a little too high. Despite the highest membership of any party in Europe, the biggest increase in its vote in a UK general election since 1945, and the most inept campaign in living memory by the Conservative Party, despite the self-congratulatory back-slapping and the now semi-mandatory chants of “Oh Jeremy Corbyn” that opened conference, Corbyn is not Prime Minister. Labour has earned the right to be taken seriously again – but it needs an additional 64 seats if its to form the next UK Government. And it cannot forever duck and dive on Brexit, hoping to concentrate on Tory divisions. This isn’t sustainable or serious politics at such a time of crisis. Leadership cults and worship are never advisable. Imagine the Scottish Nats chanting the leaders name under Salmond or Sturgeon at her peak, or the Tories under the imperial reign of Thatcher? Meanwhile Scottish Labour faces another leadership contest. Whoever wins the battle between Richard Leonard and Anas Sarwar will be the sixth leader since the SNP won in 2007. None of the previous contests have shown that the party has much insight into what went wrong in recent years and where to put it right. But at least the party is starting to get into the habit of having debates – something it didn’t do in its years in power. Neither Leonard or Sarwar are fully paid up Corbynistas although both claim allegiance to the UK party leadership. That is more problematic for Sarwar, who last year signed a motion of no confidence in Corbyn. The son of former Glasgow MP and businessman Mohammed Sarwar, who succeeded his father to the Glasgow Central seat in 2010, Anas has been hit by controversies about his business interests. He had a 23% share in a family business United Wholesale (Scotland) (motto: ‘We Lead, Others Follow’) which he has now divested. It is a company without union representation and which doesn’t pay the living wage. But Leonard, while the favourite, has only been a MSP since 2016 and is a ponderous, slow public speaker who hasn’t yet mastered the arts of political debating and the soundbite. One of Scotland’s most staunch Corbyn supporters, Neil Findlay, MSP for the Lothians since 2011, has just published ‘Socialism and Hope: A Journey through Turbulent Times’. This concentrates in diary form on the period January-September 2014 when the indyref debate reached a crescendo and the aftermath where Jim Murphy defeated Findlay to become Scottish Labour leader, before going on to lead the party to near-destruction in the 2015 UK election. But it also offers insights into Scottish Labour, trade union and working-class culture, left politics generally, and the emergence of Jeremy Corbyn as UK party leader. Findlay’s account foregrounds the importance of place, the past, working class struggle, and the act of collective remembering in the culture of the party and wider movement. Findlay is from the West Lothian former mining town of Fauldhouse and his affinity and identification with the small town shines through large parts of this book. He champions Fauldhouse Miners Welfare Club, its annual Gala Day, the local junior football team (Fauldhouse United), even the cricket club (the second oldest in the country) and the golf club. An acute sense of the importance of the past is evident from the annual memorial to commemorate the Auchingeich pit disaster of 1959 in which 47 miners died. From the long fight for an amnesty for those striking miners who were they believe wrongly convicted and blacklisted as a result of the 1980s strike. Findlay gives candid assessments of political enemies (Boris Johnson is a ‘ham actor’, Michael Gove a ‘little squirt’, UKIP MEP David Colburn a ‘bampot’) – but he is equally unsparing closer to political home. He is furious at the Better Together campaign (a ‘fiasco’) and Labour’s effort in the indyref, worrying they were in danger of throwing away victory. His greatest invective is directed towards Jim Murphy who in the indyref, according to Findlay, was ‘trailing around Scotland standing on an Irn Bru crate shouting at passers-by and conning the madder elements of the Yes campaign into abusing him.’ Even when Murphy is hit by an egg in Dundee, you sense that Findlay’s sympathies lie less with Murphy and more the egg thrower. The analogy with Rangers FC is obvious. A successful team, media-friendly owner and manager, well-known stars, but built on sand and when pressure is applied, everything falls apart. That is the reality of New Labour. No matter how energetic Murphy and Co. are, no one believes what he says. This project also has foundations of sand. Of the current Scottish Labour candidates his view of Anas Sarwar is lukewarm: ‘well-mannered, ambitious and extremely well-connected’. Richard Leonard is ‘a really clever and articulate man’. Findlay has subsequently nominated Leonard. But there is little analysis which shows any sense of why Scottish Labour has fallen so low, or what a left-wing politics of the future would look like. Instead, there is a lot of displacement and bewilderment about Scotland and a political culture which has moved away from Findlay and his kind of left-wing politics. This is combined with a mix of bravado, machismo and settling scores, but also a degree of personal honesty and self-reflection rare amongst politicians. Yet, with Corbyn as leader of British Labour, the party’s left are ascendant in a way they never have been before. That means the attitudes and pronouncements, silences and omissions, from the ‘Morning Star’s’ view of the world to Brexit, matter more than ever. After the events of the last few months, and the wider backstory since the financial crash, Prime Minister Corbyn looks more likely than it ever has been. But that would be merely the beginning of more uncertainty, rather than a new dawn.